Our siding and coil roofing nailer reviews are for the framing and roofing professional who uses it for hours on end. When you work a full day, you can’t use sub-par tools that slow down your progress. You make more money when your tools help you get done more quickly and efficiently. We review both pneumatic roofing nailers as well as cordless gas models like the Paslode CF325Li cordless framing nailer. 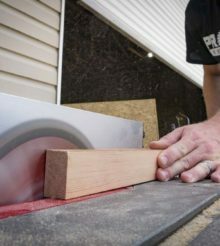 When we do our siding and roofing nailer reviews, we expect the right blend of features and performance. The best tools will hold up to our on-the-job product testing. We test for dry fire lockout, speed of loading coil nails, and ergonomics. When you use a tool on a roof all day long it needs to feel good in the hand while performing consistently and reliably. It also must be able to accurately and repeatedly fire roofing and siding nails into framing material, and roof decking. Out tool reviews involve Pro in the field, utilizing tools on the jobsite or in line with jobsite applications. We attempt to convey how each roofing nailer will perform in the field.